Red Wing’s work boots aren’t always just a part of one collection. Don’t let that fool you, though. These are the boots that earn Red Wing Shoes our reputation for durability, quality, and comfort. Red Wing work boots are found at every job site in the land, on the feet of men and women who together form the backbone of this great country. Red Wing Shoes has built the best work boots in the world since 1905. For many years, that was our sole focus! As the decades rolled on, our reputation rolled out, and footwear from Red Wing became the official footwear that hard workers buy… for hard work. In the modern era, Red Wing has branched out. We now provide outstanding boots for all types of challenges. However, our dedication to building the very best work boots in the world has never wavered. With modern materials combined with tried-and-true techniques and mountains of experience, you’re in good hands when you buy Red Wing Shoes. View the gallery below to see some shots from the store, and check out the videos to learn more about Red Wing Work Boots! No doubt you’ve seen a pair of our work boots before; they are ubiquitous among the job sites, work sites, and construction sites throughout the country. We’re proud of our reputation for comfort, durability, and overall quality, and we’re proud to be America’s work boot. 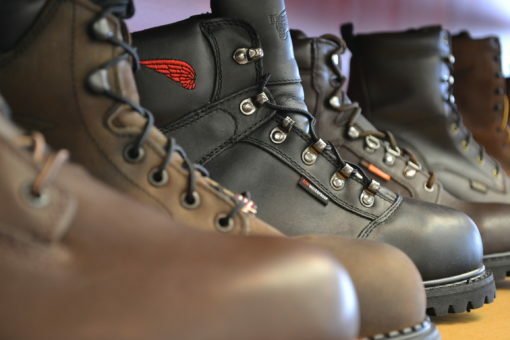 If you are interested in learning more about Red Wing Work Boots, the best work boots in Richmond, VA, and the country, just stop in at any of our three Richmond area Red Wing Shoe stores, contact Red Wing Richmond online or call us! We’d be happy to answer any questions you have. We look forward to hearing from you!